As I went through the clutter of boxes, drawers and shelves in my house, I discovered that most of what I found was just junk but I did find what I consider a few gems. My favorite would be this old pair of gloves. These really take me back to when I was a little girl and occasionally wore white, lacy gloves to church. These gloves were probably my mother's and I think they are so elegant. They aren't white but I love the scallops along the wrists. They are clean, no stains and I will keep them -- not because I have a need of them, but because they do remind me of a more genteel time when everything wasn't casual. They make me think of Little Women where Jo had a ruined glove at a party and she had to hold her gloves, rather than wear them -- or maybe she held one and wore one. It's one of my favorite childhood novels. I don't always like to dress up. I love to wear my "garden clothes" and my comfy sweats, but I do enjoy "cleaning up," too. I found these in the old play closet upstairs and I am sure my daughter played with them, but I will save them for posterity, if nothing else. I also found a few old jewelry items. Most of the silver was tarnished and I think I will clean it up and maybe give it to my granddaughter, if she likes it. I also found what I think is material from an old flour sack. It is textured just like they were and does have a hem on one side. I don't know but I think it would make a lovely apron so I will save this material. Don't you just love these old treasures? I just need to be sure not to save too many of them because they will just become another box of clutter. Dear Deberah, I love today's photo! 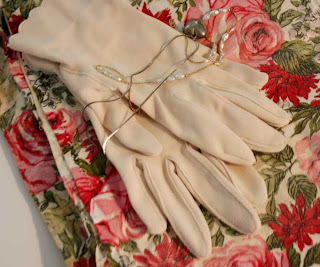 You have such an 'Artist's Eye,' with the gloves, the fabric and the jewelry - so pretty! I don't know if the shop is still there or not, but when we lived at Fort MacPherson, we used to go to Hapeville to a vintage clothing store. The owner was a retired flight attendant from Delta (she preferred being called a stewardess) and she had the neatest assortment of vintage clothes, purses & hats, along with great stories too! My son was born in 1994 & I was able to buy all sorts of 'little boy suits,' from the 1950's, they had been her sons' outfits and they looked like new - they were in such good condition. She would tell me how they took the train to downtown Atlanta, of course they wore hats & gloves - 'we were always dressed up!,' and she would remark how she did not like all the casual dressing of today. We're enjoying our snow days and your column today brought back some fond memories.